Written by: Rebecca Miller on July 7, 2017. Joan Lee, 93, passed away July 6, 2017 in Los Angeles after suffering a stroke earlier in the week. 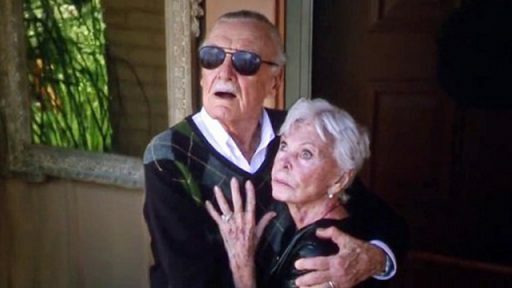 Lee, wife of Stan Lee, provided her voice for 1990’s animated shows of Fantastic Four and Spider-Man and a cameo in 2016’s X-Men: Apocalypse. She also wrote the 1987 novel, The Pleasure Palace. Good thing for him, he did, and they married with in a hour of Joan’s divorce, by the same Judge who granted the divorce. He went on to say in the same interview that He had been ready to quit his publisher and leave comic books, disappointed in the direction of the genre and disappointed in his “serious novel writing career” not working out. Joan challenged him to hold on until he created just one comic series he was really proud of before quitting. The Fantastic Four came out of her challenge and changed the course of comic book history. Our hearts go out to Stan and his family in this time. She was the muse behind many of his greatest creations, pushing him to greatness and he most of all will be missing her. Prayers for Stan.